This is a classical reprint edition of the original 1971 edition of An Introduction to Bayesian Inference in Economics. This historical volume is an early introduction to Bayesian inference and methodology which still has lasting value for today's statistician and student. The coverage ranges from the fundamental concepts and operations of Bayesian inference to analysis of applications in specific econometric problems and the testing of hypotheses and models. Arnold Zellner was a leading economist at the University of Chicago Booth School of Business who pioneered the field of Bayesian econometrics. 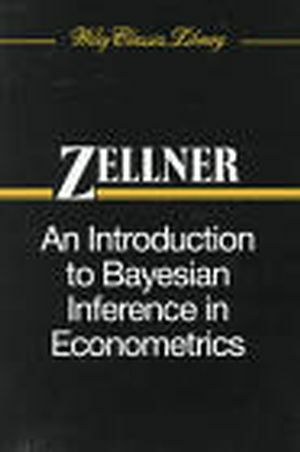 Zellner was known for the breadth of his contributions to many different areas of econometrics. His pioneering work in systems of equations, Bayesian statistics and econometrics, or time series analysis would each have earned him worldwide recognition. An award-winning teacher, Zellner published more than 200 scholarly articles and 22 books and monographs, including An Introduction to Bayesian Inference in Econometrics, J. Wiley and Sons, Inc., 1971 and Basic Issues in Econometrics, University of Chicago Press, 1984. Remarks on Inference in Economics. Principles of Bayesian Analysis with Selected Applications. The Univariate Normal Linear Regression Model. Special Problems in Regression Analysis. On Errors in the Variables. Analysis of Single Equation Nonlinear Models. Time Series Models: Some Selected Examples. On Comparing and Testing Hypotheses. Analysis of Some Control Problems.